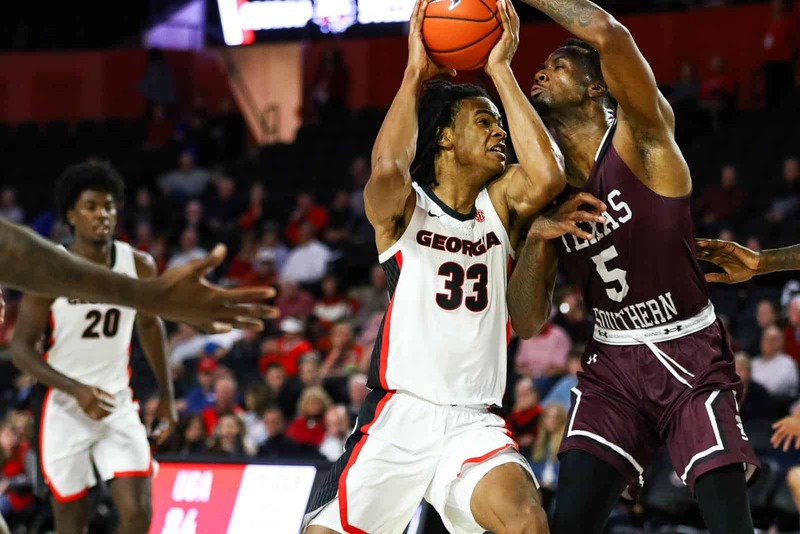 ATHENS, Ga. – With five different Bulldogs reaching double-digits in point production, the Georgia men’s basketball team defeated the Texas Southern Tigers 92-47 in Stegeman Coliseum on Monday night. Junior guard Tyree Crump totaled two career-highs with 25 points and five 3-pointers, guiding the Bulldogs to 11 overall from behind the arc, which matched the most by the team this season. Senior Derek Ogbeide had his second double-double of the season, scoring 13 points and grabbing 10 rebounds. With 10 boards, he matched Marcus Thornton at No. 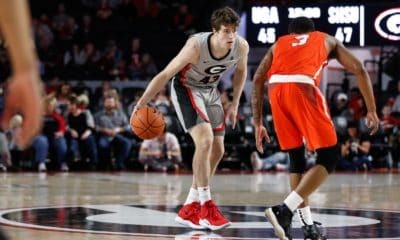 14 (664) on Georgia’s all-time rebound list. Sophomores Nicolas Claxton (15), Rayshaun Hammonds (14), and Teshaun Hightower (10) also posted impressive point totals. The two teams traded buckets back-and-forth, until five different Bulldogs (5-3) fueled two separate seven-point runs. A three from Hightower gave Georgia its largest double-digit lead of the half, 17, over the Tigers (3-6). With 7:10 remaining in the half, a 3-pointer from Claxton started a 9-0 streak for the Bulldogs. Crump tipped in the ball with less than 30 seconds remaining to notch the 52-35 total going into the half. For the second time this season, Georgia eclipsed the 50-point mark in the first half. Within the first 15 seconds of the second half, Hammonds’ layup established a 54-35 lead. Crump’s fourth 3-pointer of the night at 10:55 gave Georgia its first 20-plus point lead, 21, of the game. A tip-in from freshman Jojo Toppin marked the largest advantage, 25, of the game at the 8:13 mark. Texas Southern attempted to chip away at the Bulldog lead but was unable to push the margin below 12. A pair of free throws from Hammonds in the last minute solidified the Georgia 92-74 victory, keeping the Bulldogs’ home slate clean. 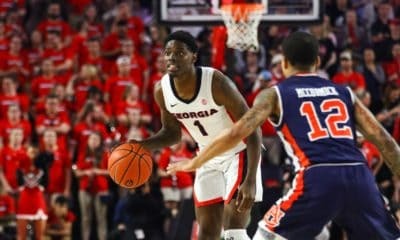 Georgia notched a season-high mark from behind the arc at 50 percent. The Bulldogs also registered 36 points in the paint. This marks the third time this season that Georgia has checked in with at least 50 rebounds as a team. The Bulldogs return to Stegeman on Dec. 15 against the Arizona State Sun Devils at 6 p.m. on the SEC Network. • Georgia is now 10-0 against current teams in Southwestern Athletic Conference and 1-0 all-time vs. TSU. 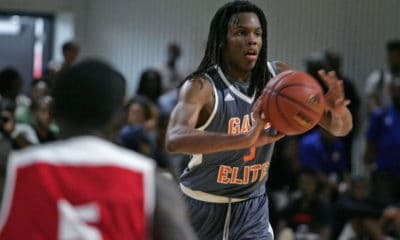 • Georgia is now 3-1 with the starting line up of William Jackson II, Teshaun Hightower, Rayshaun Hammonds, Nicolas Claxton, and Derek Ogbeide. Bulldogs with consecutive starts are Hammonds (12), Claxton (8), Ogbeide (14), Hightower (2), and Jackson (5). Jackson has 56 career starts. • Georgia remains undefeated at home in 2018 with a 4-0 record. Two of those games are 90+ points. • Texas Southern is the fifth school Georgia has played this season that reached a 2018 postseason. The Bulldogs are currently 2-3 in those games. • For the second time this season, Georgia eclipsed the 50-point mark in the first half (59 vs. SSU). Three Bulldogs already had double digit scoring marks (Claxton-11, Ogbeide-10, Crump-10). • Nicolas Claxton had three of the team’s six blocks. In half the games this season, he has at least three blocks. Last season, he finished with that same number (4) of three-block games. 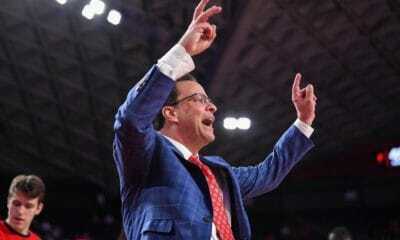 • UGA grabbed 50 rebounds for its third 50+ board game of the season – a feat done just once last season. Entering the contest, UGA’s rebound margin was +7.6. Tonight it was a +15 differential at 50-35. Claxton, who leads the SEC in rebounds with 9.0 a game, grabbed exactly nine. • Georgia outpaced its opponent in points in the paint (36-28) for the sixth time this season.